Caption: Cho! why him nuh hold de unbrella good ova mi head. Him think ah PJ one fi get shelta? Caption: "The rain actually fell at a funeral that the Rt. Hon. P.J. 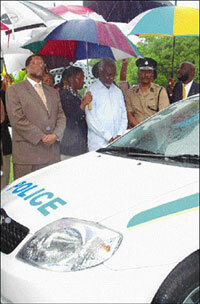 Caption: If this no mek me win the elections nothing will. Caption: ..I wonder how long these will last..